Periodically, every teacher needs to step back and reassess his or her technique. New energy and inspiration are required to keep the job from swallowing you whole. For yourself and your students, take time to forget about what you’re expected to do and try something new. 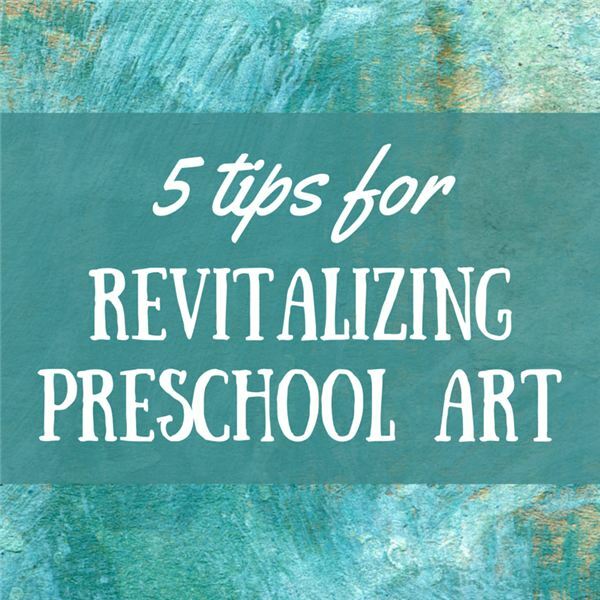 The following five tips may refresh your preschool art time. A new angle may be just what your class needs. Do you feel required to send kids back to their parents with proof they did something today? Sometimes school art is a receipt for the time (and tuition) spent at your school. Resist this pressure and focus on the process. Making art is learning how to express yourself and create. Even at three or four years old, students can use art to display how they feel. Managing all the large and potentially volatile emotions within is an essential skill to be learned in school. It’s not easy for the little ones. They might successfully express themselves with paint on paper. Or maybe they need to tell a story. Perhaps they need to dance it out, no matter how crazy or unrhythmic it might look. Whatever the means, it may not leave a product that can be sent home. Some of your students will make something for the refrigerator. Some may not. This is not failure and be prepared to tell parents what their child did do, rather than what he didn’t. Art is also about technique. Little hands gain dexterity by handling pencils and brushes. They can learn these skills with clay, also, but juggling or playing might work better for some. Encourage them to handle objects of all kinds. Have students draw with both hands. Can they paint with their toes? How does the process change when the pencil is between their teeth? Let them use a variety of techniques to tell a story, build a picture or just make a mess. Expressing what’s in the mind through hands, feet and any other means is the important thing. The students are also here to learn communication. Can one look at a picture and tell the other how to draw it? They are not too young to play Pictionary. Have them draw their favorite toy or food so the class can guess. Digital cameras are so intuitive to use now, your students can certainly try their hand. Send them on a scavenger hunt to document various items around the classroom. Can they tell a story in ten pictures? Challenge them and they just might surprise you. Make a short movie with the teacher as director and cameraperson. Give your students the basic story and a few minutes to gather costumes and props. Teach them a new version of “Red Light, Green Light" where the commands are “Action" and “Cut." Keep the camera handy to record classic moments throughout the day. Particularly keep an eye on the students who are not that into creating art on their own. When they make up a game, build something with blocks or are improvising with a friend, catch it for playback later. If you have parents that are still expecting receipts, you now have digital images for them. Feature pictures and videos with your routine emails home. The parents will know you’re having a powerful effect on their children. Sometimes, a change of medium will spark creativity. There’s only so much you can do with the same construction paper. Also, materials are not cheap. Finding a free source may make funds available for other needs, like field trips. Reach out to your community to find art materials. Local offices probably have outdated desk calendars that are perfectly good for drawing, painting and folding. Your nearest print shop may have no use for the end rolls of large format paper. Architects and construction companies often have excess blueprints you can use. Lumber yards have extra wood that can be painted or crafted into something new. Florists discard flowers they can’t sell, but are beautiful to your students. Send a letter or email before you call or stop by. Let them know how it will help your little friends and include pictures. Tell them how it will reduce garbage headed to the landfill. Repay them with pictures of things you’ve created. Get the parents involved. Many things that would be thrown away can be brought to school. Christmas alone should supply you for weeks. Build a collage with images, numbers and letters from cereal boxes. Not only are you reducing cost and waste, you are providing new food for the imagination. What will your little brilliant ones make with the donated carpet samples? What can they do with the mountain of paper spaghetti from the document shredder? Art is dirty. At least the good stuff is. Encourage your parents to send the kids in clothes they don’t care about. Keep around at least one spare set for every student. For parents with tight budgets, have a community tub of clothes collected from garage sales and thrift stores. Now that they’re dressed right, you can get to work. Finger painting makes the experience tactile. Don’t just paint with color. Paint with texture and feel. Peel off the socks and paint with feet. Of course, use the washable stuff, but they’re still going home in need of some laundry time. And don’t settle for brushes. Roll golf balls in paint. Use some tools from the garage. Wad up a newspaper. Learn cause and effect through different tools. Be sure to dress the part, too. Don’t be the teacher that backs away from a paint-handed kid. Administrators, don’t confuse professional dress with professional behavior. Loosen your dress codes and let your teachers dress practically. Many interesting textures can be built from ordinary items. Warm water, grated soap and toilet paper make a fascinating muddy goo. Various seeds mixed with a little water make a unique grainy experience. Gather an array of materials, from sandpaper to pebbles to flour, and get their hands in it. Have them describe and compare the feeling of each. Pass around magnifying glasses so they can get into the shape and viscosity. In any way, break out of the mold. Worry less about the results, the seasons or what other teachers are putting on their walls. Concentrate of the fun, the creativity, the teamwork and the skills learned when your class expresses itself artistically. Murphy, Lisa. Play. Rochester, New York: Ooey Gooey Inc., 2003. Print.